Do you like to wear full lace wig or lace front wig? 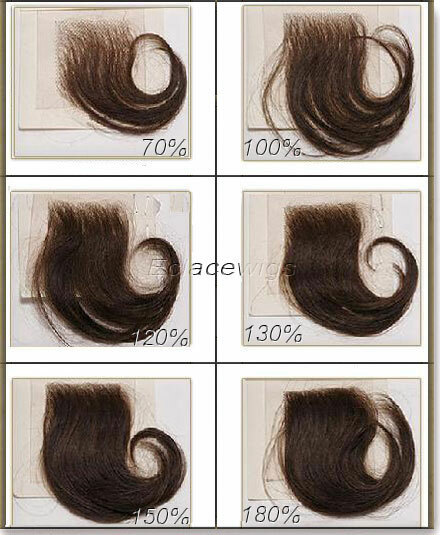 I think you may feel your human hair lace wig is not thick enough sometime,didn't you?it will waste money and time if send back to seller to add density.and some seller will refuse to add hair density for you sometimes.did't you consider to add thicker hair yourself?making lace wigs is a labor-intensive industry, but not difficult task if you have the necessary tools and have enough time to tie hundreds of hair on the lace base for your full lace wig or lace front wig to get a natural new looking.Before you begin to sew hair on your your full lace wig and lace front wig, you will need a few specialized tools that must be purchased at hair or beauty stores. Once you complete your wig, you will be able to wear it whenever you like, and you can tell anybody else that your new wig is the result of hours of work. 1.Measure the head of the person for whom you plan addd hair density on the full lace wig and lace front wig.record the measurements,and the wig will be more suitalbe than before. Transfer the measurement to the mannequin head. These measurements are then marked accurately on to a mannequin head, so that you can start the process of constructing a new and suitalble wig cap. Before you begin sewing, make sure you refit the cap that you'll make in section two to ensure that the calculations are correct. 2.Buy same hair like your lace wig from shop or from online store,you can buy from your wig seller as well. 3.Hackle the hair first before ventilating. Hackling is the same as combing the hair as usual. A hackle is a comb with teeth that are made with metal. 4.Begin tying hair to the cap. The process of tying hair to the lace wig cap is called ventilating. According to eclacewigs.com, the process is similar to hooking a rug and uses a tool called a ventilating needle!The ventilating needle looks like a fine, curved crochet hook. To tie hair on lace, take a strand or two and double it so it forms a "U" at the bottom. push through the lace cap with the venting needle, catch the strand and pull the bottom U-shaped portion through the lace. Knot the hair strand to the lace. Slide the U shaped portion of hair down toward the needle's handle,use its hook to catch the shaft of the hair on the other side of the lace and pull it all the way through the U, being sure that it is secured around a thread of the lace. The hair is now knotted, or sewn, to the lace cap. Repeat the procedure of tying hair strand until enough hair and your full lace wig or lace front wig is thick enough. For whole head full lace wig, eclacewigs.com notes this can be almost 40,00 times,but you will repeat less than 1000 times just adding hair to heavier enough density.